Drawing from our Brand Keys 2018 Customer Loyalty and Engagement Index, (www.brandkeys.com) we examined 150 categories and 1,287 brands to determine how much the single value of “trust” contributed to brand engagement and market success. The category, “Media,” was #1 in terms of “trust” contributing most (34%) to consumer i.e., viewer/reader/visitor engagement. 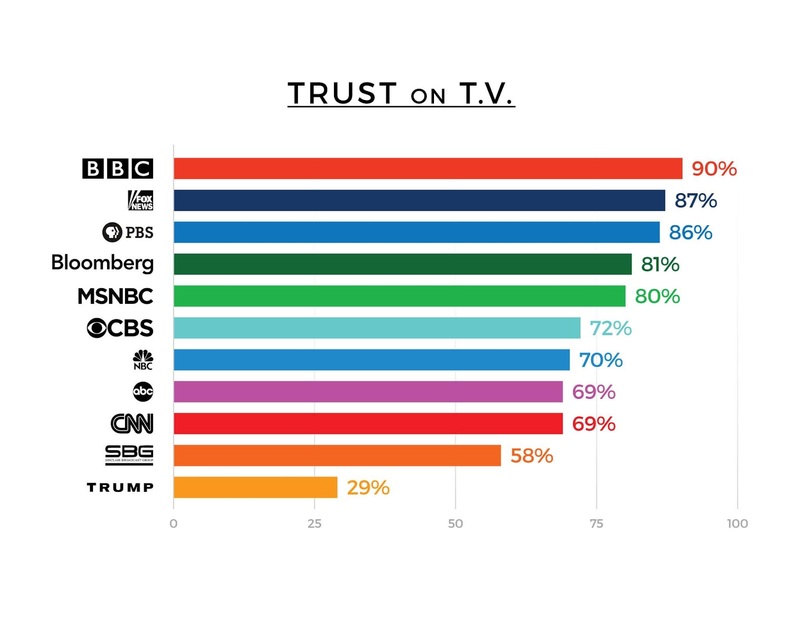 For broadcast and cable news – independent of other media formats and platforms ­– “Trust” was slightly higher, contributing 39% to network brand engagement. The remaining 61% was accounted for via attributes and values like quality of hosts, levels of commentary and insight, and credible and engaging guests. As President Trump has assailed news (of all varieties) as “Fake News,” and more recently, “the enemy of the people,” Brand Keys was interested to see how much “trust” viewers actually had in the President, versus the TV brands.